As a long-time GNOME module maintainer and as a team lead within Red Hat, I often get people coming to me for advice about some technical issue or another. And no matter the issue, there’s one question that I’ll almost always end up asking at some point: “what does the user see?” Code, APIs, protocols are all just means to the end-user experience. Discussion of the future of GNOME should also start with what the user sees. The sort of internal competition I’d like to see within GNOME is competition of ideas. Competition of mockups and prototypes, and even entire applications. We know that we need better file management within the GNOME Activities Overview for 3.2. Is that organized as a timeline? Does it involve tagging? Is it best implemented with Zeitgeist? With Tracker? With both? Those are things that are still open, and the more people that are working on different designs and approaches, the better off the final result will be. The basic constraint of any sort of internal competition within GNOME is that you have to be willing for some of your ideas to win and some of your ideas to lose. If you are starting out with the premise that you have complete final control over the user experience, then you aren’t working on GNOME, you are working on something else. So far, this seems to be the approach of Canonical. In the past, they took GNOME, modified it, and presented the modified result to their users. Now they are taking some GNOME libraries, building a new desktop on top of that, and presenting that to their users. 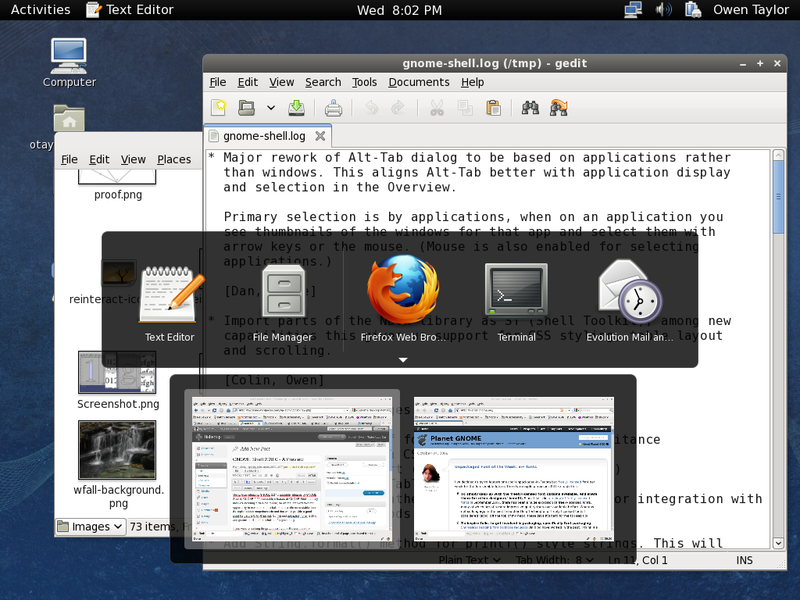 But I’ve never seen Canonical make the leap and realize that they could actually dive in and make GNOME itself better. Diving in means a commitment – it means fighting for your ideas at every step of the way, from the design level, to figuring out how the code pieces fit together, to the line-by-line details of the code. But the thing about open source is that the more you engage at this level with a project, the more you win. You become more in sync with the other contributors about end goals. You learn how to communicate with them better. And soon enough you no longer think of yourself as an outsider. You are just are another insider. Make no mistake: I’m very sad to see further splintering of the Linux desktop. I think GNOME 3 is going to be amazing, but how much more amazing could it have been if the design and coding talent that is going into Unity could have been pooled with the work being done inside GNOME? An application developer can create an application that works both within GNOME and within Unity, but we’re adding extra barriers to the task of creating an application for Linux. That’s already far too hard. No matter what happens, all desktops on Linux need to continue to work together to try and provide as much cross-desktop compatibility as possible. But we have to realize the limits of freedesktop.org specifications and standards. Many of the early successes of freedesktop.org were in places where there was broad user interface consensus. Drag-and-drop of text from one application to another made sense in all toolkits, so we made it work between toolkits. But if there isn’t consensus on the user experience, then the specification isn’t that useful. For example, appindicators start off with the proposition any application should be able to create an icon with a drop-down menu and make it a permanent part of the desktop. (I’m simplifying somewhat – the original Status Notifier specification leaves the user experience quite unspecified, but that’s the way that Canonical was using the specification.) If you don’t have that user interface concept, it’s not clear how the spec helps. So that’s what made the Canonical proposal of libappindicator strange. They didn’t engage with GNOME to make the user interface idea part of future designs. They didn’t even propose changes to core GNOME components to support application indicators. They showed up with a library that would allow applications to display indicators in a modified GNOME desktop, and proposed that GNOME should bless it as a dependency. So, by all means, we should collaborate on standards, but we can’t just collaborate on standards for the sake of collaborating on standards. We have to start off from understanding what the user sees. Once we understand what the user sees, if there’s a place to make an application written for one environment work better in another environment, that’s a place where standardization is useful. Of course, the more that designers from different environments exchange ideas and go down similar user interface paths, the more opportunity there will be for standards. Is collaboration on standards and on bits of infrastructure, and friendly exchange of UI ideas the way forward for GNOME and Unity? Are they completely separate desktops? Perhaps it’s the only feasible way forward at this point, but it certainly doesn’t make me happy. Mark: any time you want discuss how we can work together to create to a single great desktop, we’re still ready to talk. Design choices, technological choices, the channels and ways we communicate in GNOME, are all things we can reconsider. The only thing to me that’s untouchable is the central idea that GNOME is ultimately about the experience of our users. Often in GNOME, we think of goal setting is something that we can leave up to the board, or up to the marketing team. An appearance of direction that we layer on top of the what we are really working on. This is obviously backwards … everybody in GNOME should consider the goals of GNOME to be their business. I led a session Sunday morning at the Boston GNOME Summit to try and get some broader brainstorming going about where we want to go with GNOME. So, I wanted to write up both how I set up the discussion and some of the ideas that came out. Why should do we need goals for GNOME? Goals inspire us. They are great tools for recruiting contributors of all types. They allow us to create compelling marketing materials that explain to user’s what is significant about what we are creating and where we are going. And importantly, they drive decisions – they let us choose between path A and path B. This leads us to what makes a good goal: a good goal is motivational – it can inspire. It’s realistic – it has to be achievable. And it is concrete enough to let you make decisions. We can look at how some past GNOME goals fit into this framework. The most famous explicitly stated goal was the the 10×10 goal. 10% market share by 2010. It was very catchy and memorable. But even from the start realism was a huge question mark. And worse than that, it really didn’t help answer what we should be doing. By contrast, the goal of the early years of GNOME, though it was never explicitly stated, was to provide a free software replacement for Windows. Not nearly as neat-sounding a goal, but when you line it up against the criteria above it actually stacks up well. At that time Windows was the big barrier to putting users in control of their software through Free Software, so people were motivated to work on replacing it. The goal was realistic – we eventually achieved a lot of it. And it gave us lots of concrete tasks to work on. Things have moved on, but it was an effective goal for that time. Any sort of exploration of goals for GNOME involves some idea of what GNOME fundamentally is. A phrase I think captures it: “GNOME is a community of people building Free Software for users”. The direction of GNOME is set by the people working on it as individuals, not the companies that might be sponsoring some of that work. GNOME is strongly committed to Free Software, not as a temporary strategy but as a fundamental principle. And we’re not building toys for ourselves, or creating technology masterpieces for their own sake, we are trying to make user’s lives better. Within that broad set of parameters, we really have the option to do anything. We shouldn’t feel constrained by the set of things we do currently. Another thing to keep in mind is that the computing space is mind-bogglingly big these days. We don’t need to dominate even one segment of computing to be a big and successful project. But what we do need to do is create something that’s really great for the people we do touch: that meets their needs and makes a portion of their day better. And that means direct influence over the user experience. It’s pretty hard to build something that is great for users if you are just building components that other people take and re-purpose. It’s also pretty hard to to be great for users if we’re just a small slice of the total experience. To be concrete: if we’re just the stuff around the edges of the web browser, and the web browser is a tool to look at Facebook, and the user is looking at Facebook on their phone most of the time anyways. Then that’s not an experience we can do a lot to make better. We need to engage with the user beyond traditional “computers” and beyond the local application. I finished my intro with the question: the user actually gets big benefits by giving all their searches and documents and mail over to Google. Giving their social interactions over to Facebook. While the downsides of centralizing your data under someone else’s control and being able to only do the things with that data that they want to let you do may be obvious, we can’t pretend that this is a trap for the unwary and smart users will keep everything locally. How do we, as GNOME, enable an experience that is both under the user’s control and also as good or better than the experience they can get by giving up that control? In my next post I’ll describe some of the ideas that came out of the brainstorming session. Unless you’ve been hiding under a rock, if you are a GNOME contributor, you probably know the big news from GUADEC: we decided to push GNOME 3 back another six months. I obviously would prefer if this wasn’t necessary – it feels like we’ve been working on GNOME Shell for a long time now, and it would be good to get something into user’s hands. (It’s been 19 months or so since we announced the project and wrote the first code.) But it was definitely the right decision: it will give us the time to make GNOME 3 really solid, rather than pushing something not quite finished out the door. I gave a presentation where I looked at what we’ve done in the last year and where we are currently: The State of the GNOME 3 Shell. Jon talked about the big ideas behind GNOME Shell design, then together with Jakub gave a peak at some of the work they’ve been doing recently: Shell Yes!. Unfortunately, the videos for the talks aren’t yet posted anywhere. So, you’ll have to figure out what you can from slides. This may be pretty hard for my talk – a lot of the slides are just screenshots comparing where we were a year ago to where we are today. But Colin and Dan’s talk has notes in the slides, and Jon’s talk has a video mockup of upcoming shell design changes. Some media coverage: You can hear me talking with Fabian Scherschel about the shell in the latest Linux Outlaws podcast, and if you read German there’s an article by Andreas Proschofsky at derstandard.at. We had a good crowd of shell people at the conference; there were 6 or so of us there from Red Hat, and beyond that I was really happy to meet Florian Muellner and Maxim Ermilov who have been responsible for much of the progress in the shell over the last year. (I’d tell you what they’ve done here, but it would make this post too long.) Our two summer of code students were also there: Christina Boumpouka who is working on adding CSS support to LookingGlass, and Matt Novenstern who is doing a bunch of improvements to the message tray. I talked to the Tracker crowd a bit about integration of Tracker with the shell. I mentioned a couple of areas where we could use some help on the Tracker side: we need more notifications, so we don’t have to constantly requery to show the user all their files and no deleted files, and someone needs to take care of pushing files that the user actually uses into Tracker for indexing whether or not they are in the directories that Tracker automatically indexes. But basically it’s a question of finding someone with the time to sit down and do the work and implement the designs we have. The shell needs a way to search files and file metadata, and Tracker is obvious leader in this area for GNOME. I also talked a bit about remerging St and Mx with Chris Lord and Emmanuelle Bassi, though somehow I missed catching up with Thomas Wood. We’re all really positive on the idea – there’s been a lot of complementary development on the two codebases. (The way I explained it in my talk is that St has powerful CSS support, which we need for the one-off shell UI, while Mx has far more widgets, which they need for the wider range of things they use Mx for in Meego..) There’s definitely some devil in the details – we’re definitely not done with every toolkit enhancement we need for the shell, for one thing – but hopefully we can make it happen soon. Øyvind Kolås gave an awesome demo of ClutterSmith. This had the GNOME Shell designers jumping up and down to get it yesterday – enough with Inkscape and Blender. Ideally, we could have a live mockup of the shell in ClutterSmith, using the same images and CSS files as the real shell, and the designers could use that to experiment with new visual changes and motion design. Going from releasing GNOME 2.27.x unstable releases of GNOME Shell to GNOME 2.29.x unstable releases of GNOME Shell naturally involves crossing 2.28 in the middle, so we thought we’d take the opportunity to make a set of tarballs that are little more stable than the typical Friday snapshots. A good place for people to try things out. I’ve just uploaded mutter-2.28.0 and gnome-shell-2.28.0 tarballs to ftp.gnome.org. If you want to building things yourself, you still should use the JHBuild setup described on our wiki page. It’s the easiest way to do it. The tarballs are really designed for people creating distribution packages. To find all the nooks and crannys of the GNOME Shell user interface you can use the neat cheat sheet that Marina created. It’s a good way to learn about the secret commands supported by the Alt-F2 dialog without going to the source code, as well as to get an overview of the more user-oriented parts of the shell. The other big recent change isn’t so screenshot-able, but Colin and I took some interesting parts of the NBTK library from Moblin and imported it into GNOME Shell as ST (the Shell Toolkit). (We’re still cooperating closely with Moblin on the work; the rename is just to keep things non-confusing.) We get several nice things from this: scrolling, better layout capabilities, but the big change is the ability to use CSS for styling. NBTK already had a good start on this, and I then merged in some work I did last year for hippo-canvas to get extra capabilities like CSS styling of borders and fonts. This is really intended to make development easier – so we don’t have to have all sorts of hardcoded fonts, colors, and pixel sizes in the code, but also should provide a good entry point for artists to work on alternate appearances for the shell. Oh, and I quickly used ST to hack up a drop-down calendar when you click on the clock. So you can finally find out what day of the month it is in GNOME Shell without having to run ‘cal’ in a terminal. We hope people will try it out, and see how it works for them in practice; packages will be in Fedora rawhide shortly and the JHBuild I mentioned above really is easy to get going on any recent Linux distribution if you aren’t running something quite so up-to-date. If you are in the Boston area, come to the GNOME Summit this weekend. All the developers working at Red Hat on the shell will be there, and hopefully a few other shell developers as well. You can see the shell in action, talk to us, and just in case you are having trouble getting it compiling, we’ll help you with that too.